Popdose Sports: Why Aren't Americans Really, Really Into Biathlon? 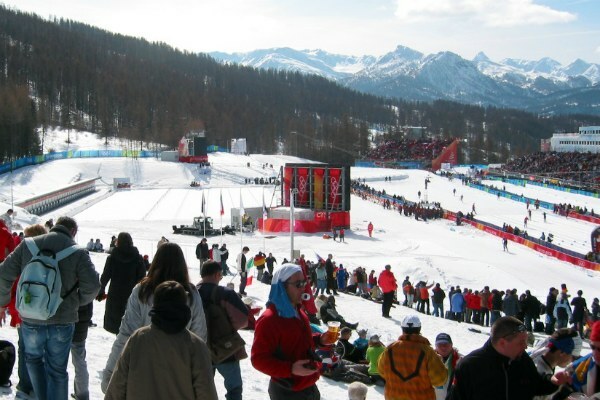 Popdose Sports: Why Aren’t Americans Really, Really Into Biathlon? Guns, fitness, snow parties … what’s not to like? Beau Dure preaches to the not-yet-converted. Test your endurance … then stop and shoot. Not with basketballs. With guns. 2006 Olympics: Are you ready for some shooting??!! That’s biathlon. Fitness, guns and a rollicking party around the course. You’d think Americans would flock to this sport. Being popular in Europe is no longer a detriment, not with Fox and ESPN competing to broadcast every meaningful kick of a soccer ball on the continent. A couple of things work against the U.S. biathlon movement. Most people tend not to live near the relative hotbeds of biathlon in this country. The World Cup races Pippen saw took place in Fort Kent, Maine, a location Smithereens fans would call miles from nowhere. It’s also a sport that tests viewers’ attention spans. Broadcasters can hop between four-minute skating routines and two-minute ski runs with ease. Biathlon races require a bit of context to set up those dramatic moments when exhausted skiers raise their guns on the shooting range with all the pressure of last-second free throws. And Americans also tend not to win biathlon races. The U.S. team is getting better — a month before the Vancouver Olympics, Tim Burke and German Andrea Henkel, the woman on the right in the Pippen video, were on the verge of ruling the biathlon world as boyfriend and girlfriend. But I can offer a first-hand perspective on how things went in the Games, having interviewed a lot of disappointed Americans on a snowbank in Whistler. Still, Lowell Bailey is a solid ninth in the current World Cup standings, and several women have had decent results this season. And these things take time. In Whistler, I saw the USA take its first medals in Nordic combined. Maybe I’ll be standing in Sochi in 2014 with icicles forming on my hood (I never said it was easy to cover) to see Burke or Bailey break through in biathlon. But the biggest issue for U.S. biathlon interest isn’t the fans. It’s the broadcasters. During the Olympics, American broadcasters don’t fallen in love with Germany’s Magdalena Neuner (she’s on the left in the Pippen video and the inspiration for this moderately creepy fan video) the way they fell for Nadia Comeneci in 1976. The rest of the quadrennium, Universal Sports and other U.S. networks have you covered if you want to see Lindsey Vonn and Bode Miller hit the Alpine slopes, but watching biathlon in the USA means one of two things — you’ve found a feed of Eurosport’s excellent coverage that you’re not supposed to be watching, or you’re at biathlonworld.com watching with no commentary. That’s an endeavor for hard-core nerds like me. When fans get a chance to see biathlon, they respond. Close races get the usually cynical folks in Olympic media centers to stop and pay attention, particularly when they get to the shooting range and the race hangs on every bullet. It’s all the color and pageantry of European soccer without the uneasy feeling that the people in the other stand might want you dead. If your kids get bored, there’s plenty of snow in which to frolic. Realistically, it’ll take a U.S. success story to create a biathlon boom in this country. Or maybe Tim Burke can follow Apolo Ohno onto Dancing With The Stars. But we Popdosians aren’t subject to the whims of popular taste. Maybe we can’t start an earth-shaking movement — “Mellowmas” has not yet entered the Oxford dictionary, as far as I know — but we can tune in and enjoy. 0:00 This is a pursuit race, which means skiers start in the same order in which they finished the sprint, which is usually a day or two earlier in a typical World Cup weekend. If you were 30 seconds behind the leader in the sprint, you’ll start 30 seconds behind the same guy in the pursuit. Notice Lowell Bailey starting fifth — he had a fantastic sprint. 0:22 The first shooting stage is prone (lying down). Sweden’s Carl Johan Bergman misses one, which means he has to ski one lap around a penalty loop. (That takes about 22-30 seconds.) Bailey knocks down all five targets but takes a while. Shooting in biathlon is sometimes a risk/reward game — you can try to mow through the targets quickly, but that increases the odds that you’ll miss and incur a penalty. Watch Norwegian great Ole Einar Bjorndaelen, who sometimes looks like he has a machine gun strapped to his back. 1:34 The leaders all shoot cleanly on the second shooting stage, also prone. 2:35 The first of two standing shoots, and again, most leaders shoot cleanly. The mild wind and the pressure weren’t affecting the leaders here. 3:30 It all comes down to the fourth and final time at the range. France’s Martin Fourcade and Bergman, who has skied quickly to make up the ground he lost on that early penalty loop, go mano-a-mano. Bergman misses twice. Fourcade obviously notices, giving a celebratory gesture as he knocks down his fifth target and skis away to a comfortable win. The women’s races draw about as much interest as the men’s. Neuner and the hotshot German women are powerhouses — perhaps they could use an ad campaign in the USA like the Maria Sharapova ad featuring a Popdose staffer at the 0:08 mark. The Ian Anderson lookalike and actalike who spoke with me for my “biathlon party” story told me emphatically he didn’t care who was competing. Or winning. He might still be partying somewhere in Whistler Olympic Park. You’re Welcome: Who’s The Singer In The Recent Hyundai Commericals?